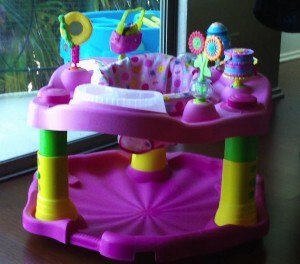 Parents must learn how the popular exersaucer impacts the development of a baby. The “goal” of this baby toy, according to the marketing, is to “help strengthen baby’s muscles for standing and walking.” Parents often love this item because they put baby in the center and then their hands are free for a while…what a relief! Although baby seems quite content in this contraption, he has no choice. Unable to change his body position or to sit when he becomes tired, his muscles fatigue and spasm (stiffen). This leads to stiffness of not only the legs but also of the torso, making it more difficult to move. Baby is stuck in a position where his view of his feet is blocked, making it more difficult for him to feel his coordination of moving his feet and leading to accidents. Unfortunately, numerous exersaucers have tumbled down stairs with baby in them. The coordination of walking is very important, and it involves using one foot to push off the ground and shift your weight onto the other foot. The fixed seat position of the saucer limits the movement of the pelvis and hip joints making it impossible for baby to properly push off the ground. This may result in difficulty later in running which requires even more of a push off from the ground, since the motor coordination in the brain was not properly learned. The bones of baby are quite soft and flexible. The process of baby learning to stand and walk takes about a full year because not only do the muscles need to develop strength, but the bones do as well. Baby’s bones are getting stronger with every crawl and every step. In a forced weight bearing position, such as standing in the exersaucer, the stress on the bones is much more difficult to reverse or correct. The width of the seat presents another problem for the bones, as it may be too wide for the size of baby’s pelvis and hip joints, forcing the hip joints to widen and leading to reduced stability in walking. The motor skill of walking requires the muscles and bones, but also the areas of the brain controlling leg movement. Think of the brain as the command center for our voluntary movements. The locomotive skills of crawling, cruising, and walking require an alternating pattern of the legs and feet: Right, Left, Right, Left. This is the pattern that the brain learns and executes as a result of movement experiences where the legs are alternating. When baby is forced to stand, baby learns to reflexively put out both feet at the same time rather than alternate feet. And as we discussed, baby does not learn to push off of the ground to shift his weight forward. If your goal is to assist baby in standing for developing muscle strength, read the Stellar Caterpillar blog entries archived under “standing” and “walking” for alternative games to play with him at home. If you need to have your hands free, put baby in a playpen where he can choose what movements to do while being kept safe from harm. Otherwise, put baby down where he has a lot of space to explore. As baby moves around on his own he is strengthening muscles and bones while getting his power to move from pushing off the ground. Soon, with nature’s guidance, you will have a shooting star! This entry was posted in PRODUCTS & GEAR, STANDING, WALKING and tagged coordination, locomotion, strength. Bookmark the permalink.